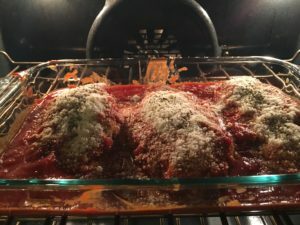 CHICKEN PARM – I will post details below step by step! 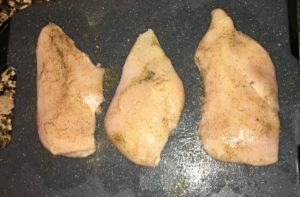 Take your chicken breasts, wash them, cut the fat off. Take salt and pepper and rub them all over the top and bottom of the chicken. 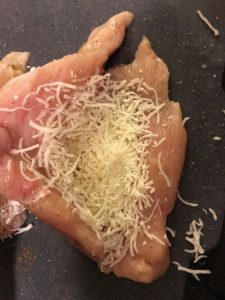 Slice the chicken in the middle- not all the way, just enough to stuff some of the shredded mozz cheese in the middle and close the chicken back up. Repeat for all 3. I grab about a handful! Put some Olive oil in a pan on med-high heat. I like to add some butter to it also just to give it a little flavor. Put your flour, bread crumbs and eggs all in a separate plate/bowl. 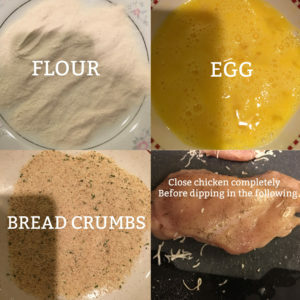 Dip your chicken breasts FIRST in the Flour, than into the eggs and roll the chicken in the bread crumbs. Once the chicken is covered- Place it in the pan on med-high heat and let it cook on each side for about 2 mins each- until its golden brown. Don’t let it sit too long, you don’t want your outside layer to burn! Make sure to check the inside when done to make sure it is all the way cooked. parsley for garnish, if desired. Cook pasta according to package. In a med skillet over medium heat melt 1 teaspoon of butter. Add the cream and slowly whisk it together. Start adding all the ingredients and whisk slowly until the sauce starts to thicken. Once it becomes thick, take it off the heat and pour it onto the Spaghetti.